The business class is general meaning for the services offered by airliners for their customers. Depending on various factors, the options and quality of business class may differ. Moreover, each air carrier attempt to exceed its competitors and provide the best business class solution for the passengers. In this article, we will compare Cathay Pacific vs Etihad Airline to reveal, which company offers the best services for elite customers. Etihad Airways is the second largest airline in the UAE. Every week the company operates more than 1,000 flights to around 120 destinations worldwide. The fleet of Etihad consists of Boeing and Airbus aircrafts. The business class configuration may differ in according with the type of aircraft. The best and newest luxury class services are offered in Airbus A380 and A330. Cathay Pacific is the major Hong Kong’s air carrier. The company operates the flights to 180 destinations in 44 countries around the globe. The airline has Airbuses (A350 and A330), as well as Boeings 777 at disposal. Unlike Etihad, the most advanced business class cabin of Cathay is introduced in Boeing 777-300ER. So, let’s see the differences of Cathay Pacific vs Etihad business class. Every air trip starts from the land. Before boarding, the passengers have to pass numerous security procedures and wait for some time until they are invited to the aircraft. It is preferably to spend this time in comfort. For this reason, both air carriers provide lounge areas for their premium customers. The lounge area by Etihad is called Etihad Premium Lounge. These areas are located in numerous airports around the globe. Here you can find seating areas to have a rest, buffet and bar to have a meal. Some lounges are equipped with Six Senses spa salons, where the business class passengers are offered with a complimentary facial. In the lounge area, you can also take a shower. The other features that you can find in Etihad lounge are several buffet areas, restaurant, and workstations equipped with PCs and MFPs. Lounge areas provided by Cathay Pacific are famous for amazing design. Naturally, depending on the airport, the lounges will differ in features, however, the business class customers can enjoy shower suites, private areas and restaurant meal almost in all Cathay lounges. If you are tired of the trip and have enough time to relax, it is recommended to visit shower suits of business class lounge of Cathay. These suits are equipped with a shower, full-sized bath and day bed for your comfort. It is difficult to choose a winner of Etihad versus Cathay Pacific Airline regarding the lounge areas, since both air carriers offer great options for the customers’ comfort on land. When you find yourself in the business class cabin, you realize the difference between the coach and elite class. Nowadays, the air companies tend to install the reverse-herringbone seat configuration for their premium class cabins. Cathay Pacific is not an exception. This configurations looks like 1-2-1, where the single seats are directed to the windows, and the middle seats angle to each other. It is rather convenient, when you travel with a partner or a soulmate. At the same time, the middle seats provide a lot of privacy for both passengers. The business class cabin by Etihad is also represented by configuration with 2 seats in the middle and one by one at the windows. The middle seats are fitted with wide armrests and dividers in-between. If you need privacy, you can raise the divider and enjoy your flight. Comparing Cathay Pacific seats vs Etihad Airways, it should be stated that both airliners offer wide seats, which have a full-flat position for sleep. The dimensions of Etihad seats are 73” long and 20” wide, while Cathay offers larger seats – 82” long and 21” wide. The seats are usually fitted with slots for magazines, bottle holders, large storage spaces, as well as IFE screens and amenity kits. You may have a look at a detailed Etihad Airways business class review, where the differences between business class cabins in Boeings and Airbuses are introduced. The choice of Cathay Pacific vs Etihad Airways food & beverages is amazing. Both airliners provide menus with a variety of dishes and drinks. Let’s see in details. Lunch in Cathay business class cabin is represented with starters (2 options), main course (4 options), cheeses and dessert. Drink menu include a wide selection of teas and coffees. Alcohol beverages comprise exquisite wines such as Chateau du Retout Esperance Haut Medoc 2013 or Liberty School Central Coast Merlot 2012 at your choice. The crew of Cathay Pacific does not take orders in advance, but simply bring out the starters and then deliver a cart with all available meal options. In time of non-meal-service, you are offered with a variety of snacks and drinks. The meal options in Etihad’s menu are broader. The business class customers are offered with 3 options of starters, 4 options of mains and 4 options of desserts. And this selection is provided only for lunch. The breakfast menu is also incredible. The wine card consists of wines of various origin including Brancott Estate Sauvignon Blanc from New Zealand and Montenero Primitivo from Puglia in Italy. If you ask, “Is Cathay Pacific or Etihad Airways better in meal servicing?” – the answer will be the draw. Both companies provide a huge selection of beverages and meals, as well as high quality of servicing. The question “Where is the best amenity kits?” is not appropriate, because Etihad and Cathay provide exclusive amenities produced by famous companies. The amenity kits of Etihad are represented by Luxe of London. The content of the kit includes earplugs, sleeping mask, toothpaste and brush, lip balm, hand cream and products by Fandango and Scaramouche. The passengers of business class are also provided with pajamas. Cathay’s amenities are represented by Seventy Eight Percent Company from Hong Kong. A kit looks like a clutch containing dental kit, eye mask, ear plugs, sleepers, and products by Jurlique (lip care balm, citrus hand cream and balancing day cream). Pajamas are offered only for the first class passengers. For this reason, the point “Is Cathay Pacific pajamas better than Etihad Airways?” is left unanswered. 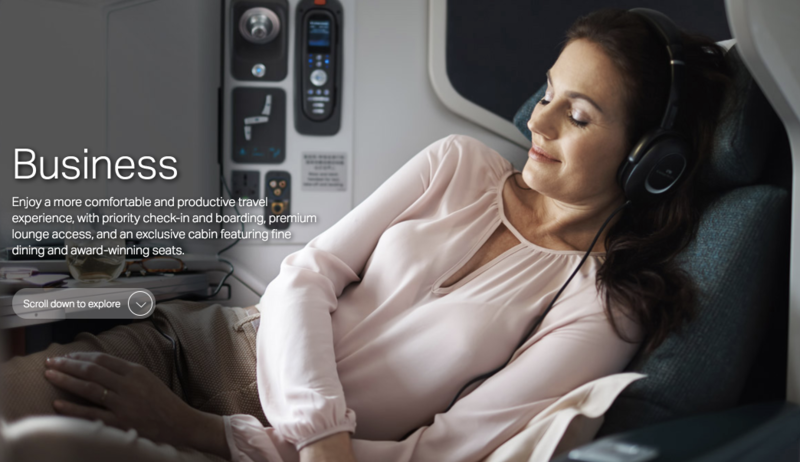 The information about inflight entertainment in business class of these companies is available in any Etihad Airways or Cathay Pacific business class review. Let’s try to answer the question “Which business class cabin is the best for personal space?” Considering the fact that Cathay Pacific offers the larger seats, we may suppose that the passengers would feel more comfortable in the business class of this company. However, we cannot state this, because it is not enough to base our guess on figures. Sleeping options in Etihad and Cathay are also of high quality. In addition to the seats that convert into bed, the passengers receive a pleasing pillow and a duvet. The flight attendants are always ready to help you in preparation for sleep. Considering the feedbacks of people who experienced a flight in business class cabin of both these airliners, we cannot say, “Where is the pillows duvets & bedding best?” All the customers were satisfied with bedding services, as well as the work of the flight attendants. You have larger private space in the Cathay’s cabin, but more meal options in Etihad. The lounge areas of Etihad Airways are a bit more comfortable, but Cathay Pacific offers top quality servicing in the air. Both companies have advantages and drawbacks, and it is up to you to decide what you appreciate or not. Make your choice and enjoy your trip with comfort.